I cruised up to Oceanside with the boys to check out a gallery I had been looking forward to seeing for awhile. Swiv Tackle Circus is the self-proclaimed “Greatest Gallertique on Earth” and while I haven’t been to all of the gallery-boutique hybrid’s in the world to back this claim, this one left quite an impression on me. The building itself is a site to see, grabbing attention on the Coast Highway with its funky signage and curbside vegetable garden; a sore thumb amongst the eclectic and outdated facades that make up this military beach town. 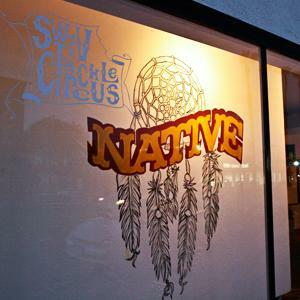 Native, a group exhibition put on by collaborators Swiv Tackle Circus and Set & Drift, brought us out that night (besides the convenient proximity to Carlsbad Pizza Port and Surf Bowl). Sean and Stacy Kelley, the power couple behind Set & Drift, have already played a roll in successfully transforming local art events around San Diego, i.e. Conspire and Reinventing the Wheel, so we were itching to see what they were up to at Swiv. We got there around dusk and DJ Blackass was front and center, spinning on the raised register/display. I couldn’t help noticing his amazing resemblance to the DJ in Zoolander. From Gremmie skateboards and bikes on the walls to giant prayer chimes hanging from the ceiling, there was a lot to look at and the circular layout of the gallery had me walking around for several laps. A couple favorites of mine were Tocayo’s new works and Shaney Jo Darden’s amazing headdresses. I rounded a corner to the back of the gallery and found myself in the middle of a mini community farmers market and was offered a blood orange. Damn they were tasty. It suddenly made sense why people were wandering the show munching on carrots and miscellaneous fruit. It’s the little details that really get me stoked on shows and Native had a lot of them. I am really looking forward to spending more time at Swiv Tackle Circus and seeing what’s next for Set & Drift.